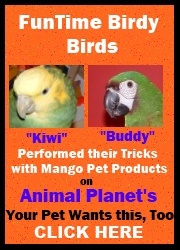 Not just a tropical fruit anymore.....but for your Feathered Friend a tropical shredding pleasure. The Pineapple Shredder bird toy is made of tightly constructed palm and sisal, stuffed with lots of shredding material inside and will easily be one your Feathered Friend's favorite shredding bird toys. Pineapple Bird Toy by Planet Pleasures Extra Large4Shirley GannonNovember 8, 2017My cockatoo likes shredding it but he did rip off the braided loop that it hangs from rather quickly but I think that is due to his size and strength. Pineapple Bird Toy by Planet Pleasures Extra Large5JimJune 26, 2016Chaucer picks apart this shreddable bird toy with precision. Pineapple Bird Toy by Planet Pleasures Extra Large5WhimsicalMarch 26, 2016I bought this for my two parakeets who dearly love to chew and shred. The size of this toy surprised me, but I hung it in their cage anyway. It took a couple weeks for them to get used to it. Now? They LOVE it. They sit on it, pull it apart, chew on it and even talk to it. I've never seen them love a bird toy so much!